Leave the beans to soak overnight (or used canned if unavailable). 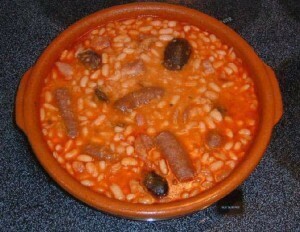 Put water on to heat in a cooking pot, when it comes to boil, add the beans and simmer, along with the bacon. As they cook, add water when necessary and let the broth thicken. In a large pan, fry the pork, garlic and onion until lightly browned, then pour in stock with the beans and bacon. add the whole cooking chorizo and a splash of Tinto (Spanish red wine). Reduce the temperature to a very low simmer for an hour. NB top up with a little hot water if it becomes too thick, to avoid it sticking & burning. Add sweet paprika and add salt as necessary. Finally about 5 min before serving add the black pudding to heat through. Serve the beans piping hot with crusty bread. For a variation try serving with cabbage, or adding chunks of potato (the size you would use for roasties) when you add the chorizo.